Stay safe while cycling with this Clip-On Bicycle Safety Light featuring a three-position push switch for flashing and turning on and off. 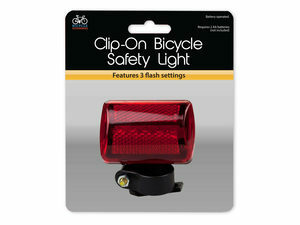 Light is black plastic with a red lens over lights and has a 1" screw and nut closure for the clip mount pivoting attachment. Operates on 2 'AA' batteries (not included). The light case measures approximately 2.75" x 1.75" x 1". Comes packaged in a blister pack.